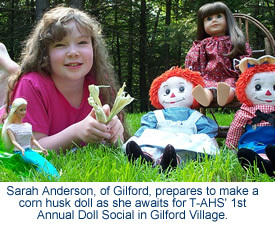 Thompson-Ames Historical Society will hold its 1st Annual Doll Social in Gilford Village on October 1, 2005. This event will take place from 10 a.m. until noon, at the Mt. Belknap Grange Buildi ng, 8 Belknap Mountain Road. Weather permitting, activities will take place on the lawn outside the Grange so that participants can enjoy the beautiful fall weather. T-AHS board members Carol Anderson, Kathy Lacroix, Carmel Lancia, and Diane Mitton have teamed up to create a morning full of fun and surprises. Come and spend a morning with, Felicity, this year's T-AHS raffle doll. Tour the historic John J. Morrill Store and the Grange's Homestead Room to catch a glimpse of what life might have been like for Felicity. Dress up or come as you are; wear a decorated hat, bring a favorite doll, and be prepared to share a story or two with fellow doll enthusiasts. Pre-registration is required since seating is limited to ten children, all of whom must be accompanied by an adult. T-AHS realizes that throughout history, a young girl's favorite doll was not just a toy with which to play; it was also an instrument that taught her basic sewing skills as she stitched clothes for this special doll. Dolls today have become so much more than toys; many have become collector's item. To honor historic dolls and Gilford's rich farming history, participants in the social will be able to make a farm-style, corn husk doll. These old-fashioned dolls are a sharp contrast to the elegant dolls that we have today. Still, their primitive charm intrigues us and makes us ponder a simpler life. T-AHS board members have been gathering up corn cobs and husks for this activity, just as farm girls did on those numerous Gilford farms. Discarded pieces of corn were given new life as they were transformed into dolls. Years ago, even a simple rag doll was not a guaranteed birthday or Christmas gift, as even rags were needed by the family to patch quilts or to make rag rugs. Corn husk dolls were, therefore, the most common doll on the farm. Also on display will be wooden penny dolls made by the many T-AHS volunteers who make up our woodworking group. Stan Piper, a wonderfully gifted, local artist carved the faces and bodies for these jointed dolls. Penny dolls were extremely popular in the 1800's since wood, like corn, was plentiful and not an expensive material to use. As we think about the simplicity of these dolls, or observe the wonderful details of today's dolls, we can understand the great desire that all children have and that is to hold a doll of their own. This is something that transcends time. Dolls now are larger, the most popular being the 18-inch doll. In October as the cool, crisp autumn weather arrives and leaves turn the brilliant colors of fall, many children's thoughts turn towards Halloween. In order to help celebrate this American holiday, Carol Anderson, who created Felicity's raffle wardrobe, has designed a Halloween costume for an 18-inch doll. This costume will be given away at the end of the social through a free drawing. What would be an old fashioned get-together without refreshments? The children who attend this event will, of course, be able to enjoy some delicious treats, some of which will be doll-sized. Won't you join us for a wonderful morning of camaraderie and activities as well as some great surprises? Since pre-registration is required, please call the Thompson-Ames Historical Society at 527-9009. You can also register via e-mail at thomames@worldpath.net, or in person at the Grange Building, 8 Belknap Mountain Road, whenever the open flag is flying. Children of all ages are reminded that they are always welcome to learn skills such as doll making at T-AHS' Heritage Arts Bees. These bees are held every third Saturday of each month (except November and December) at the Grange Building in Gilford Village. This group meets from 10 a.m. until noon and light refreshments are always available.